Our cam lock with removable barrel is uniquely designed to suit a range of high security needs. It has been designed with the utmost attention to detail, with it's heavy duty exterior making it ideal for all your high security applications, where you valuables need to be kept safe. This is seen in the many applications, unique construction, superior strength, durability and security, along with it's flexibility and usage. Applications: This lock is suitable for use in coin doors, machine doors, gaming machines, vending machines, filing cabinets, parking meters, coin laundry machines, cash dispensers, payphones and is available in a range of sizes suitable for all applications. Unique construction: The unique construction of our cam lock allows for the barrel to be removed. The barrel is removed using a separate key. You use the special removal key like any other key, except when the key is turned the barrel can be removed. This in turn makes changing the locks easy, rather having to remove the entire lock, it is possible just remove the barrel with the turn of a key. Superior strength, durability and security: The locks are made of zinc alloy with chrome plating, making them extremely heavy duty and durable. 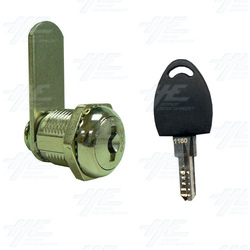 The construction of the key itself also adds to the security of the lock, the key itself is difficult to imitate. This also makes picking the lock virtually impossible. Flexibility and usage: This lock is also extremely flexibly not only in it's many applications as listed above, but also in the customization available; both the latch and locking mechanisms can be customized to suit you needs. There are also 720 different key cut combinations available. Furthermore, this lock is also very easy to use with a smooth locking and unlocking, also the key can be removed whilst the lock is opened. Making it possible to use the same key to open multiple locks simultaneously. Our cam lock with removable barrel is uniquely designed to suit a range of high security needs. It has been designed with the utmost attention to detail, with it's heavy duty exterior making it ideal for all your high security applications, where you valuables need to be kept safe. This is seen in the many applications, unique construction, superior strength, durability and security, along with it's flexibility and usage.